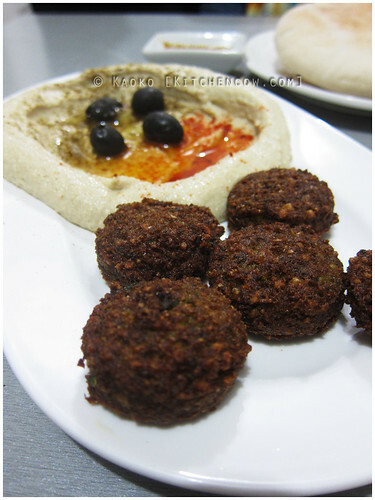 Beni’s Falafel: A Hole-in-the-Wall Hummus Try! I have a favorite falafel-an. I like it so much that I’ve happily appended the -an/-han suffix, much like our local tapsihan, gotohan, and barbecu-ehan. Appropriately enough, it’s a tiny hole-in-the-wall, much like most joints that have earned their -an/-han suffixes. This falafel place is called Beni’s Falafel. I apologize for the silly pun in the title. But I couldn’t resist. Sorry. First off, what’s a falafel? Hailing from the Middle East, a falafel is a fried bean fritter. Think, vegetarian meatballs. Chick peas or fava beans are minced with an assortment of strong spices, like cumin, coriander and garlic, then fried. In appearance, it looks like a meatball. But when you bite into the green-tinged center, you can tell that this isn’t your grandmama’s meatball. The most popular thing on their menu is Beni’s Falafel, a pita pocket loaded with five balls of falafel, shredded cabbage and onions. Provided with it are two squeeze bottles — one of a creamy white dressing, and the other of a super spicy chili sauce. The reason why it’s popular is apparent upon first bite. Beni’s Falafel is a meaty non-meat sandwich. It has the mouthfeel of a burger, without the greasiness. It packs a strong flavor, with all the spices, then mellows with the addition of the creamy dressing. The chili adds heat, so you’ll probably want to grab a soda with it. Another dish we enjoy is the combination hummus and falafel platter. Chick pea overkill, I know, but I still can’t get enough of it. The platter comes with five falafels, a generous side of hummus (with black olives), and a fluffy piece of pita. Their pita bread is thick and pillowy, the way it’s prepared in Israel, the lady behind the counter tells us. The pita they use is made by an Israeli expat. And an award on the wall claims that their hummus is one of the best and most authentic. 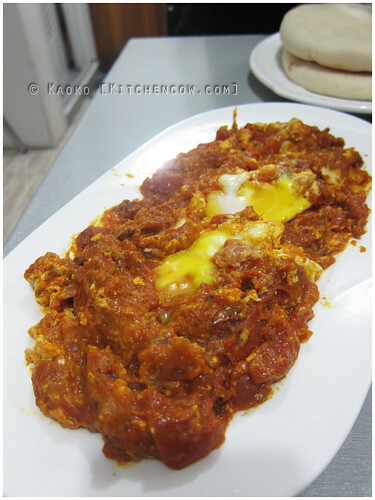 For tomato lovers, there’s the shakshouka, another traditional Middle Eastern dish which features stewed tomatoes, onions, and a poached egg in the center. This is also served with pita and is perfect if you want something hearty. 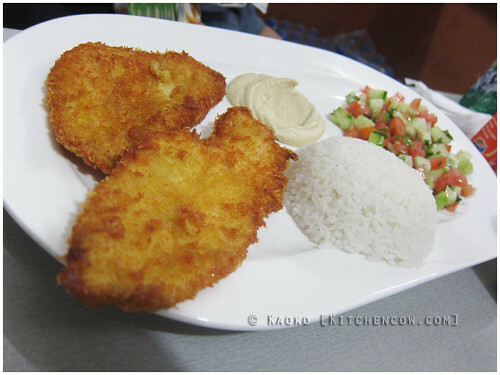 They have meat dishes, like this Chicken Schnitzel, but really, it’s all about the falafel. Beni’s Falafel is a very small place. There are just three small tables sharing the interiors, along with an even smaller open kitchen. There are two additional tables outside, if you don’t mind eating on the sidewalk. Despite the unassuming vibe of the place, it’s often crowded by expats and backpacking foreigners, enough to make you curious about eating there. While Beni’s menu is on the slim side, the dishes they do offer are good enough to keep a steady clientele coming back. 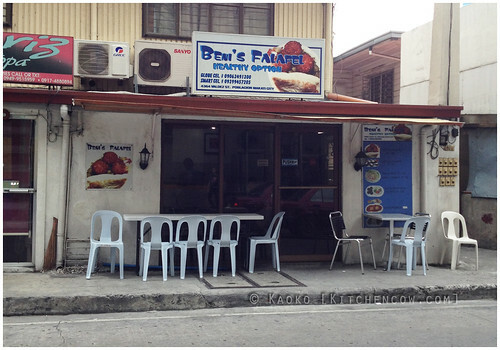 Beni’s Falafel can be found at 4364 Valdez St. Poblacion, Makati City, across A.Venue Mall. 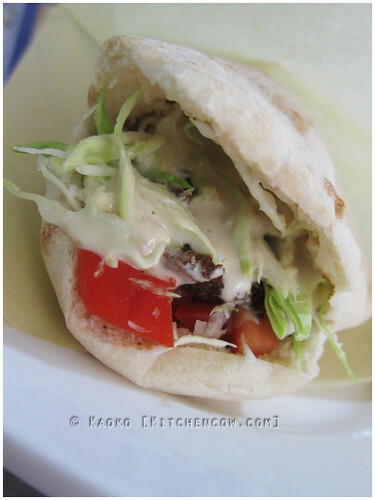 10 Responses to Beni’s Falafel: A Hole-in-the-Wall Hummus Try! That’s it! Imma going to try this on Monday. Let me know if you get to try that eggplant filled pita pocket. And their baba ganoush. Curious about both but haven’t had the chance to try it yet. Since I am super excited, I flagged down a taxi from the airport with my luggage so I can try it. Haha. Man, going all eggplant next time. Sabich & Baba Ganoush, here I come! I’m going to A. Venue tomorrow. I am tempted to try this one!! Birthday dinner of a friend. So tempting to lure them here instead hehehe. I wanna try!!! But I get lost in Makati. I don’t even know where A-Venue is. Hahaha! Will googlemap nga.